Introducing a new, summer-flowering Sweet William - just the plant that we have been waiting for! The introduction of Dianthus barbatus 'Dash Magician' means that these fragrant beauties are no longer reserved just for the spring. One of the most innovative breeding breakthroughs in recent years, this new strain has been developed to produce stunning, fragrant flowers right from the start, flowering in the first year, unlike other varieties which dally until their second season. Dianthus 'Dash Magician' is fast to flower, produces long-lasting, big, blousy flowerheads that bring quick summer colour to the garden and blooms on sturdy, long stems, making it perfect for cutting and bringing into your home. 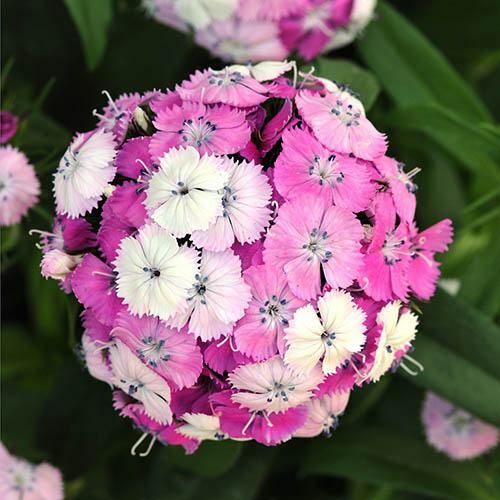 An easy to grow hardy perennial, the Sweet William is an old-fashioned cottage garden plant, and this modern variety produces masses of colour changing, fragrant flowers that open white and mature to shades of pink and rose from late spring into summer. Prune plants back hard in midsummer if they become scruffy or floppy. Don't deadhead plants completely, leave some on to self-seed. Plants are easily divided in early autumn or spring. Remove fading flowers to encourage more buds to form. The compact plants perform best towards the front of a border or in a patio container all summer. Plant approx. 20cm (8”) apart to allow them room to grow.